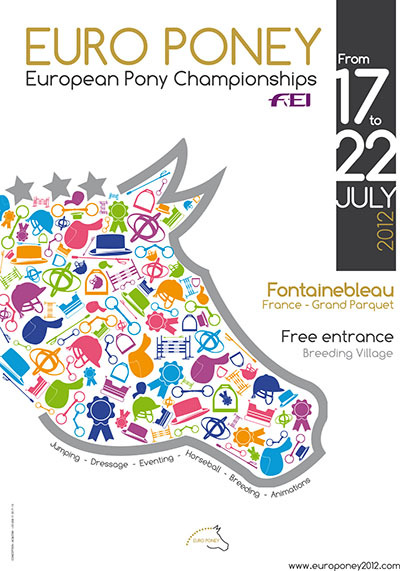 The 2012 FEI European Pony Championships are being held from 17th - 22nd July in Fontainebleau, France - more information can be found on the Championships website - here. The SPSS will have representatives at the event and plan to do daily updates. The outline schedule at 15th July is given below. 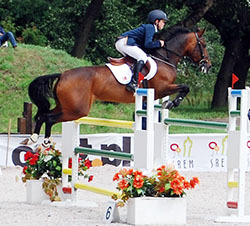 For the latest information look at the Euro Poney 2012 Website. Beth Adams (age 16) with Julie Adams' 13 year old chestnut mare Some Like It Hot (breeding unknown). Beth and Some Like It Hot were very consistent at the trials, being clear in each round at the first trial; 4th in the trial at Bolesworth and 5th in one of the trial classes at South View. They were also 6th in the Grand Prix in Moorsele in May, double clear in the Nations Cup and 7th in the 1.25m class in Hagen in June. Millie Allen (age 14) with Peter Allen's 9 year-old bay mare Song Girl (breeding unknown). 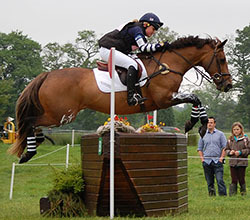 Millie and Song Girl won the CSIOP Grand Prix at Fontainebleau in April and were in the winning Nations Cup team and 2nd in the Grand Prix at Hagen in June. Alex Chitty (age 15) with Amy Chitty's 10 year-old grey mare Amilie JR Z (Artos Z x Ewout VD Kleine Roost). 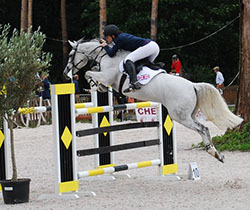 Alex and Amilie JR Z were 7th in the CSIOP Grand Prix at Fontainebleau in April and 2nd placed individually in the Nations Cup and 5th in the Grand Prix at Moorsele in May. Amy Inglis (age 15) with Mandy Hall and Claire Inglis’ 11 year-old bay gelding, Nils D Hurl Vent (Quick Star x Boogie de la Gere). Amy and Nils d Hurl'Vent were members of the 2011 Gold medal winning team. They were also members of the 2010 team and finished 4th in the Individual competition. In 2012, they were 10th in the CSIP Grand Prix at Fontainebleau in April and double clear in the Nations Cup and 4th in the CSIO Grand Prix at Hagen in June. Jessica Mendoza (age 16) with her Sarah Mendoza's 14 year old chestnut mare, Tixylix (Cavalier x Lauriston). Jessica and Tixylix were members of the 2011 Gold Medal winning team and were also Individual Bronze medal winners. In 2012, they were 2nd in the FEI Pony Grand Prix in Moorsele, Belgium and performed well in the trials. 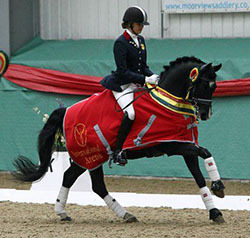 Tixylix is alrso a double European Gold medallist in 2007 with her previous rider, Zoe Adams, and with Jessica won the German, Dutch and Belgium Grand Prix and Pony of the Year in 2009. 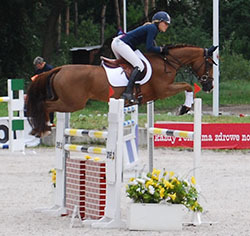 Jessica and Tixylix were also members of 2009 and 2010 Pony Europeans teams. Four of the riders will form the Team, the remaining one will compete as an individual. 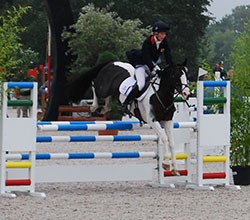 The final trials for the Jumping Ponies were held on the 29th, 30th and 31st June as part of the British Masters competition at South View Equestrian Centre, Cheshire. Full results are not available but the top ponies in each of the classes are as listed and some new names have come into the placings. There has been no team announcement from British Showjumping yet. Phoebe Peters (age 13) with Tracy Peters' 10 year old brown gelding, SL Lucci (Lucas x Bazar). SL Lucci was on the 2011 Danish Bronze medal winning team. Maisie Scruton (age 15) with her own 11 year old black SPSS Elite stallion, Rembrandt DDH (Renoir x Viktoria's Chirac). Members of the 2011 British team. Erin Williams (age 14) with Clare Williams' 8 year old palomino mare, Dynasty (Deinhard B x Arts-Dancer-Boy). Erin was on the British team in 2010 & 2011 with Danny Boy B.
Harriette Williams (age 15) with Becky Moody's 7 year old bay mare, Madam’s Miss Maria (Woldhoeve's Silco x Wester Aikema's Norbert). Bethany Horobin (age 13) with her own 14 year old chestnut gelding, Gigolo (Going East x Nordcap). 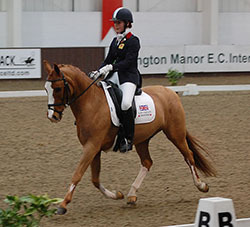 Team reserves in 2011 and Gigolo was on the 2009 & 2010 British teams with Claire Gallimore. Aimee Witkin (age 15) with Alexandra Rowe's 14 year old chestnut gelding, Ferrari (Mailbu II x unknown). Members of the 2011 team and Ferrari was also a member of the 2010 British Team with Charlotte Gill. 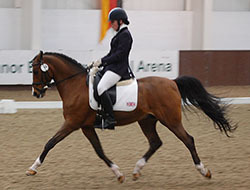 2011 top scoring British Team pony SPSS Elite stallion, Rembrandt DDH and Maisie Scruton, pictured on thier lap of honour having won the final trial at Wellington Premier League. 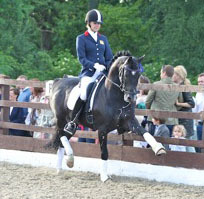 The compulsory final dressage trial was held at Wellington Riding Premier League Dressage Festival on Sunday 10th June. The competitors rode the 2012 FEI Pony Team Test 2012. The judges were France's Raphaël Saleh at C and Britain's Jennie Loriston-Clarke at M. Both judges are on the FEI 4* list and Raphaël Saleh is President of the Dressage Jury at Fontainebleau so it is great to see such high scores. Some of the ponies also entered the Freestyle to Music Pick Your Own Class the day before and the top ponies (placing 2nd and 3rd overall) were the SPSS Elite Stallions, Rembrandt DDH (ridden by Maisie Scruton) and Bernwode Brokat (ridden by Ruth Hole). 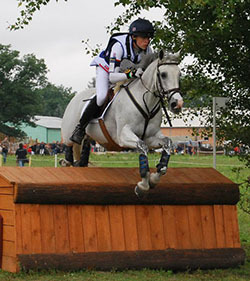 Following the Charles Owen British National Pony Championships at Brand Hall, British Eventing announced the squad of riders who will represent Britain at the Pony Euros. Four of the riders will form the British Team, the remaining two will compete as individuals. Janou Bleekman with Team Bleekman's Cregaan Scenic, an 12 year old Irish bred piebald mare. Members of 2011 Bronze medal Team, placed 13th individually. 2nd at Aldon. Cregaan Sceinc also won Team Silver in 2009 with Katie Bleekman. Annie Keir with either Belinda Keir's 12 year old chestnut gelding, Hotshots (unknown breeding) or with Belinda Keir's 16 year old chestnut mare, Castleview Rakish Milly (Rakish Paddy x unknown). 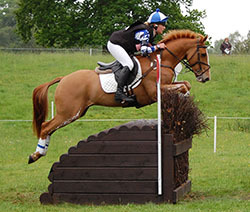 Hotshots was 10th individually in 2010 ridden by Sophie Howe. Castleview Rakish Milly won Team Silver and Individual Bronze in 2011 ridden by Jodie O'Keeffe (IRL) and also competed on the Irish team in 2006 (rider Aoife Freyne), 08 (David Hannigan), 09 (Jane Hannigan) & 10 (Jodie O'Keeffe). Louisa Nesbitt with her own 15 year old Irish bred bay gelding, Carrowmore Gemstone (unknown breeding). Non-travelling reserves in 2011. Madeleine Taylor with her own Bandalera (Ski Dancer x Corston Comet), a 17 year old liver chestnut part bred Welsh mare. Finished 8th individually in 2011. Laura Birley with her own 9 year old bay gelding, Ottava Rima (unknown breeding). Janou Bleekman with Team Bleekman's 11 year old grey gelding, Toberpatrick Larry (unknown breeding). Tilly Williams with Mrs Katie Williams' 10 year old bay gelding, Wye Valley Fabristeard (Templebready Fear Bui x Pennington Drummer). On the BE website, Chairman of Pony Selectors, Sarah Hancox is reported as saying: "This year's Charles Owen Pony Squad is a great mix of established and also up-and-coming riders at this exciting young level. Not only are there are few riders from recent years' teams but also some of the four-legged stars are making a reappearance with new riders." The British Pony Squad title sponsors are Charles Owen and the squad is also generously supported by: The Worshipful Company of Saddlers, Natural Animal Feeds (NAF), Toggi, Tim How of How’s RaceSafe body protectors, the Horse Trials Support Group, New Equine Boots and Show Hire. The squad and reserves will be at Barbury Castle International Horse Trials in Wiltshire (28 June – 1 July) for a final trial. 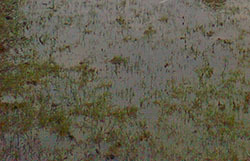 Sadly the very wet weather from lunchtime on the second day of the show meant that the ground conditions became very wet and muddy and most of the pony showjumpers withdrew from the remaining Viewing Trials classes. Of the 7 combinations that did jump on the 4th June, one was eliminated and 2 retired. Emily Ward & King Mac were the only clear and so won again - as the main jumping ring at Fontainebleu is also on grass, these wins on the grass at Bolesworth must have brought Emily & King Mac to the selectors attention. 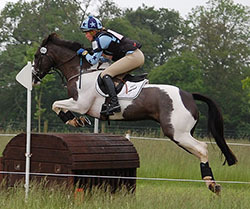 The last of the key selection events for the Eventing ponies was the 2* Charles Owen British Pony Championships at Brand Hall from 1-3 June. The event was run over 3 days with the ponies doing their dressage on the Friday, cross country (XC) on the Saturday, then Show Jumping on the Sunday. The ponies all had to pass an initial "trot up" in front of the Ground Jury and Vet on the Thursday and again on the Sunday morning prior to the Show Jumping phase. 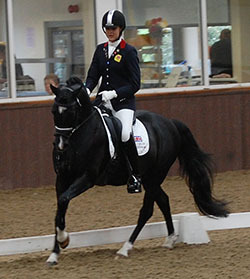 In the dressage, only one combination managed to score below 40 penalties. This was Constance Copestake & Pebbly Paint Box (unknown breeding) who scored 39.7. 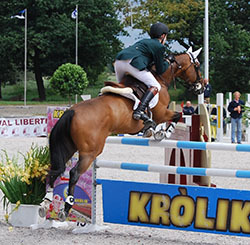 Nearly 7 penalties behind, in second place, were Janou Bleekman & Toberpatrick Larry (unknown breeding) and Janou also had her 2011 Pony Euros partner, Cregaan Scenic (unknown breeding) in 3rd place. Also scoring under 50 penalties were Yasmin Sanderson & Iratu Varagnac ((Abbeyleix Fionn x Island Shawn), Francesca Fitzherbert & Done And Dusted VI (Dusty Boy x unknown) and Amelia Scholl & Master Macky (unknown breeding). Sadly, the dressage leaders, Constance & Pebbly Paint Box, fell on the Cross Country as did 4th placed Yasmin & Iratu Varagnac. However, Janou achieved clear rounds within the time on both of her ponies, so held the top 2 places after XC. 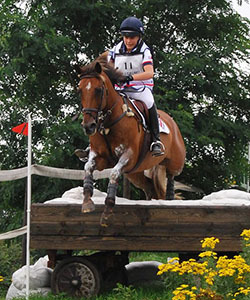 Francesca & Done And Dusted VI were also clear within the time and moved into 3rd place. Clears within the time also moved up Louisa Nesbitt & Carrowmore Gemstone (unknown breeding) and Diana Bevan & A Touch Of Spice (unknown breeding) while Amelia Scholl & Master Macky (unknown breeding) just collected a few time faults to stay in 6th place. Three combinations were withdrawn before the Showjumping then the course proved challenging with only 6 combinations going clear within the time, possibly due to the ground conditions following heavy rain. Twelve faults dropped Janou & Toberpatrick Larry from their position as overnight leaders to finish in 9th place but she was clear in the time on Cregaan Scenic to win the event and gain the selectors’ attention. Francesca & Done And Dusted VI also picked up 12 jumping faults however they had 9 time faults as well so dropped well down the order. Diana & A Touch Of Spice had 8 jumping and 2 time faults to finish 11th while Amelia & Master Macky were one of three combinations eliminated. Hence, clear rounds in the time moved Louisa & Carrowmore Gemstone up to 2nd place and Charlotte Bacon & Three Wells Breeze (unknown breeding) to 3rd place, and will have helped both their chances of team selection. The final results are shown in the table below and more pictures can be seen on Facebook. 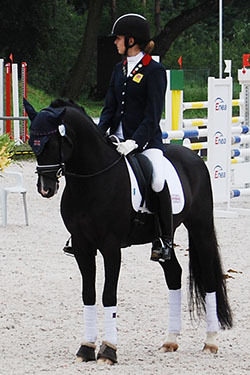 Four of the top dressage team contenders competed at the CDI at Compiègne, France from 1-3 June. Phoebe Peters & SL Lucci (Lukas x Bazar) excelled in the Team and Individual Tests, scoring over 70% for 3rd place each time. Maisie Scruton & SPSS graded stallion Rembrandt DDH (Renoir x Viktoria's Chirac) were close behind in 4th place in both of these tests and then scored 72.925% in the Kur to finish 5th. Erin Williams & Dynasty (Deinhard B x Arts-Dancer-Boy) had a disapointing result in the team test, scoring well below their norm and finishing in 18th place. In the Individual test, they were close behind Phoebe and Maisie in 5th place, then in the Kur they were back on top form, scoring a personal best of 75.7% and finishing 2nd. The fourth team member, Harriette Williams & Madams Miss Maria (Woldhoeve's Silco x Wester Aikema's Norbert) scored nearly 68% in the Team Test for 11th place, then 66.38% in the Individual Test (18th out of 34 in the class). Neither Phoebe nor Harriette competed in the Kur. The compulsory final trial is at Wellington Premier League on the 10th June. The selectors will then announce the squad after the 17th June. The fourth nominated competition for dressage ponies, the Somerford Park Premier League, took place on Saturday 26th May. The numbers entered were lower for this event as many ponies had already done the minimum of two nominated competitions and those in contention for team places had also been abroad recently. However, top team contenders Phoebe Peters & SL Lucci (Lukas x Bazar) and Erin Williams & Dynasty (Deinhard B x Arts-Dancer-Boy) both competed in the Team Test. Judged by Sarah Leitch and Jo Graham, Phoebe & SL Lucci won with the great score of 72.63%. Erin and Dynasty were second on 68.53% with Charlotte Fry & Andexer (Anjershof Rocky x Wester Aikema's Norbert) improving on thier recent form to score 68.21% for 3rd place. Bethany Rose Horobin & Gigolo (Going East x Nordcap) were a couple of marks behind in 4th. Neither Phoebe nor Erin competed in the Pony Individual Test on the second day, but scores were still high, with Bethany-Rose & Gigolo wining on 70.73%. Alexandra Snape & DHI Lionceau (Lucky Lao x Night Star I) improved on their 5th place in the Team Test, scoring 2% more to stand 2nd on 69.88%. Charlotte & Andexer were 3rd on 66.10%. The next key event for the dressage team selection is the compulsory final trial at Wellington Premier League on the 10th June. The selectors will then announce the squad after the 17th June. 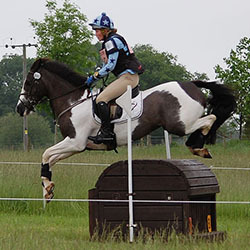 The next selection trial is the Charles Owen British National Ponies Championships on the 1-3 June at Brand Hall, Hales, Market Drayton, Shropshire TF9 3TP. The ponies do their dressage on Friday 1st June, go Cross Country from 9am on Saturday 2nd then Showjump from 08.30 on the final day. The first of the Viewing Trials for the Jumping Ponies took place at the David Broome Event Centre (Wales and West) from 4-6 May. There were 3 main Pony Trial classes, one on each day with a warm up class (max height 1.25m) as well on the first 2 days. On the 4th May, 18 of the 25 competing ponies went clear in the Warm Up class, which was judged over the one round and Emily Ward & Wizard VIII (Okkie Trooi x Sonny Af Hojmark) were the fastest clear and won. Then in the European Pony Trial (max height 1.30/1.35m), 13 of the 26 ponies jumped clear and and went forward to the jump off. 9 ponies were clear again and the winner with the fastest clear was Christie Pritchard & Touch of Frost V (breeding unknown). The next day, just 14 ponies did the warm up class and only 4 were clear with Emily Ward & Wizard VIII winning again. In the main Pony Trial class, the course must have been challenging as 6 of the 27 ponies were eliminated or retired and another 4 had more than 12 faults - including the experienced combination, and team regulars, Jessica Mendoza and Tixylix (Cavalier x Lauriston). The ponies only jumped one round in this class and 5 ponies were clear so the results were determined on their time with the winners being Darby Ward & Enzo III (breeding unknown). 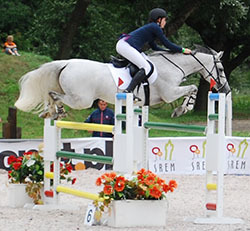 On the final day, there was no warm up class and the main pony class was the "European Pony Grand Prix", with a maximum fence height of 1.35m. Seven ponies jumped clear in the first round, so there was a jump off, and 5 were clear again with winners being the 2011 double Gold medallists, Beth Vernon & Falaza (Libro x Embla George). As well as Beth Vernon & Falaza all of the other members of the successful 2011 Europeans team were also competing in the Trials, with mixed results. Jessica Mendoza & Tixylix had bad rounds in the first 2 trials, but improved to have just 4 faults in Grand Prix. Graham Babes & Dollar Girl (breeding unknown) went through to the jump off in the first Trial class (when they had 4 faults to finish 11th), but then withdrew from the 2nd Trial class and Grand Prix. Amy Inglis & Nils D Hurl Vent (Quick Star x Boogie de la Gere) were 9th (with a double clear) in the 1st Trial, 3rd (with a clear) in the 2nd Trial and 6th (clear then 4 faults in the jump off) in the Grand Prix, so they showed the most consistent form of the group. The Dressage Selectors chose to send a number of combinations to the International Shows at Saumur (27-29 April) and Den Goubergh Roosendaal (4-6 May). Both shows suffered from heavy rain before/during the events, affecting arenas and ponies as the tests were all outside (the pictures on the right are from the Addington CDI earlier in April!). At Saumur, the CDIO team comprised of Aimee Witkin & Ferrari (Malibu II x unknown), Maisie Scruton & SPSS graded stallion Rembrandt DDH (Renoir x Viktoria's Chirac), Phoebe Peters & SL Lucci (Lukas x Bazar) and Bethany Horobin & Gigolo (DRP, Going East x Nordcap). With strong competition from Germany, Denmark, Belgium and Switzerland, all of which had sent their top riders, and missing team stalwart Erin Williams, the British team finished in a disappointing 5th place, just ahead of the Netherlands team. 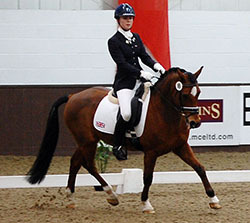 Aimee and Ferrari were the top scores for GBR, gaining 67.9 for 14th place individually. Both Rembrandt and SL Lucci scored well below expectations in the team test; however, both recovered their form to place 5th and 7th in the Individual Test and Rembrandt then scored an impressive 72.125% to finish 5th in the Kur. Gigolo was just behind Rembrandt & SL Lucci in the team test, then equal 14th with Ferrari in the Individual. In the Saumur CDI, there were another 4 British pairs entered and in the Team Test, Harriette Williams & Madams Miss Maria (Woldhoeve's Silco x Wester Aikema's Norbert) scored 67.564% and placed 4th with Jade Ritchie & Principal (Principal Boy x Black Boy) 7th, Charlotte Fry & Andexer (Anjershof Rocky x Wester Aikema's Norbert) 11th and Amber Barton & Doctor Little (De Vito x Marquis AA) 14th. In the Individual Test, Doctor Little and Principal improved to finish 5th and 6th (despite their riders each having an error of course!) with Madams Miss Maria and Andexer close behind in 8th and 9th. In the Kur, Jade & Principal placed 3rd with the good score of 72.05% and Harriette & Madams Miss Maria were 7th. Just a week later, in the CDIO at Den Goubergh, Erin Williams and Dynasty (Deinhard B x Arts-Dancer-Boy) lead the team into 3rd place overall by winning the team test with an impressive 72.73%. Maisie & Rembrandt improved from Saumur, scoring 69.23% and Bethany & Gigolo also improved to score 67.44%. Robyn Smith & Siepke’s Celtic (Bjirmen’s Wytse x Oakley (C) Bubbling On) completed the team and scored 65.427%. In the Individual Test, Maisie & Rembrandt were 5th and Erin & Dynasty 8th with the others finishing lower down the order. Rembrandt & Dynasty were the only British team ponies to go through to the Kur but they both scored over 70% with Erin & Dynasty finishing in 2nd and Maisie & Rembrandt in 6th - great results against a strong Dutch contingent on home ground. 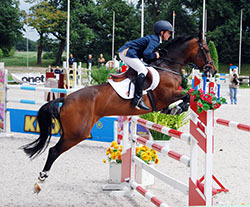 There were also 2 British entries in the Den Goubergh CDI, Alexandra Snape & DHI Lionceau (Lucky Lao x Night Star I) and Alexandra Hellings & Dublin (De Vito II x Evenaar NPA). Both had a disappointing time in the Team Test but Dublin improved to finish 13th in the Individual Test. compulsory final trial at Wellington Premier League (10 June). A number of ponies will also attend the International competitions at Moorsele, Belgium (17-20 May) and Compiègne, France (31 May - 3 June). 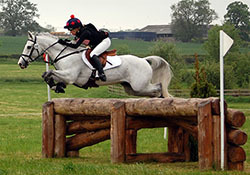 Sadly the Eventing Pony Trial scheduled for 28th April at Withington Manor had to be cancelled due to the excessive rain. The next designated selection event is the Charles Owen British Pony Championships on 1-2 June at Brand Hall, near Market Drayton, Shropshire TF9 3TP. All the pony dressage will take place on Friday 1st June. 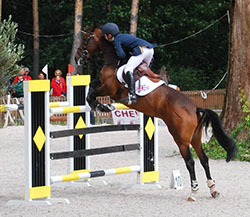 On the final day of the Jumping Pony International in Fontainebleau, both top classes were won by British riders. In the CSIOP Grand Prix the course was set at 1,35 and GB's Millie Allen & Song Girl (GBR/Farmkey, breeding unknown) were one of 8 clears in the first round. Millie & Song Girl then posted a fast clear in the jump off that could not be beaten by the 3 riders who went after her and they all had faults trying. Then in the CSIP Grand Prix, Emily Ward & Dafina K (GER/OLDBG, Dover x Calypso I) were one of 12 combinations to jump clear in the first round and were then the first pair to go clear in the jump off and none of the following eight riders could beat her time. Congratulations to all ponies and riders, but in particular to Constance Copestake and Anne Kier for both having 2 ponies in the top 6. Carrowmore Gemstone (IRL, breeding not known) & Louisa Nesbitt. 2nd at Weston Park & 5th at Lincoln. Hotshots (GBR, breeding not known) & Annie Kier. 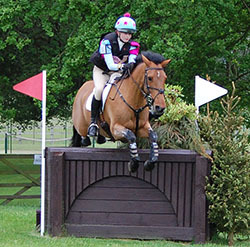 1st at Weston Park; 6th at Aldon and 10th at Oasby. 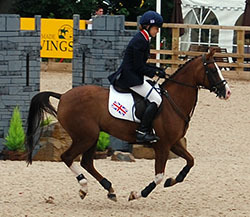 Hotshots was 10th individually at the 2010 Pony Euros ridden by Sophie How. Monbeg Hero (IRL/ISH, breeding not known) & Anna Wilks. 4th at Lincoln & Weston Park. Mr Moon (GBR, breeding not known) & Constance Copestake. 4th at Weston Park & 3rd at Lincoln. Nookie Bear (breeding not known) & Charlotte East. 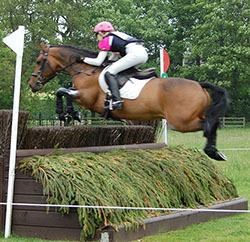 3rd at Weston Park & Oasby, 9th at Aldon. Pebbly Paint Box (IRL, breeding not known) & Constance Copestake. 1st at Weston Park & 6th at Lincoln. In the Nations Cup at the Jumping Pony International in Fontainebleau today, at the end of the first round, Germany led with 0 faults, then Ireland & France on 4 faults and GB with 5 faults. For GB, there were clears from Millie Allen & Song Girl (GBR/Farmkey, breeding unknown) and Graham Babes & Dollar Girl (NED, breeding unknown). Darby Ward & Maradonna (BEL, Eastern Whisper x unknown) had 5 faults and Christie Pritchard & Birchill Dessy (IRL/IHR, breeding unknown) were the discard score with 12 faults. It appeared to be a challenging course with 6 Eliminations in round 1 alone!! Six teams went through to the second round (faults carried through in brackets): GER (0); FRA(4); IRL(4); GBR(5); NED(8); FIN(8). The first three GB riders, Millie Allen (Song Girl), Christie Pritchard (Birchill Dessy) and Darby Ward (Maradonna) all jumped clear to put the pressure on the teams above. With three German riders having four faults and the other one being eliminated, they dropped behind GB to eventual 4th place. A clear for the last Irish rider kept them just ahead of GB and a disastrous 12 faults for the last French rider dropped them down the order to finish in 5th place. A double clear from the British-bred pony, Rock Dee Jay (Arko x Louella Inschallah III) helped the Netherlands to rise into 3rd place. Bred by Sharon Quigley, Rock Dee Jay was on the Silver medal winning Irish team in 2011, finishing 11th individually. 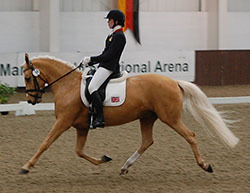 In the Young Pony classes, Emily Ward and the 7 year old King Mac (GBR/BSJA, breeding unknown) were second in the first class and won the second class. Both times they jumped clear over a 1m20 course. Class 7 (CSIOP 1m20) - 7th= Christie Pritchard & Touch Of Frost V (GBR/BSJA, breeding unknown). 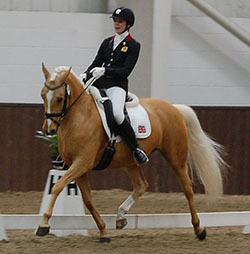 In addition, Emily Ward has the 7 year old King Mac (GBR/BSJA, breeding unknown) entered in the Young Pony classes. Although the first of the Viewing Trials for Jumping Team selection doesn't take place until early May, the Pony of the Year Show took place over the Easter weekend and the Pony of the Year JA Grand Prix may well offer some indication as to this year's top pony and rider combinations. Excitingly, the SPSS graded British-bred mare Falaza (Libro x Embla George), who with rider Beth Vernon won Team and Individual Gold at last year's Pony Europeans, won the class and £1,000. Falaza and Beth were foot perfect across first two rounds in the final and then recorded the fastest clear round in the jump off. Slightly slower for 2nd place were Alex Chitty and Belgium-bred Amilie JR Z (Artos Z x Ewout VD Kleine Roost). Pony Euro team veterans (and 2011 Team Gold medallists) Amy Inglis and Nils d Hurl Vent (Quick Star x Boogie de la Gere) were also clear for 3rd place. Also, from the 2011 Gold medal winning team, Graham Babes and Dutch-bred Dollar Girl (unknown breeding) had a fence down in the jump off and finished in 5th place. 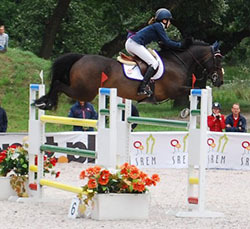 The other members of the 2011 Gold medal winning team (and individual Bronze medallists), Jessica Mendoza and Tixylix (Cavalier x Lauriston) were out in Moorsele, Belgium, where they placed 2nd in the FEI Pony Grand Prix behind the British rider Christie Pritchard and Irish-bred Birchill Dessy (unknown breeding). The Dressage Selectors were in attendance at Addington CDI over the Easter weekend to see 12 of the potential British team combinations compete in the Team and Individual Test classes. There was strong competition from the continent, with Semmieke Rothenberger and the 2008 European Champion pony Deinhard B (DRP, Dornik B x Golden Dancer) coming over from Germany as well as combinations from the Netherlands and Belgium. In the Team Test, Semmieke and Deinhard B won with 73.077% and Jelle Peeters & Den Ostriks Dailan (NWPCS Sec K, Leuns Veld's Lord x Kraneveld's Kadans) scored 72.735% for 2nd place. Excitingly, the new British combination of Phoebe Peters & Danish-bred SL Lucci (Lukas x Bazar) scored 70.769% and placed 3rd. More continental riders filled the next 3 places (the full results can be seen here) then GBR's Maisie Scruton & SPSS graded stallion Rembrandt DDH (Renoir x Viktoria's Chirac) were 7th. Rembrandt & Maisie also scored over 70% and were only 0.726% behind 3rd place. 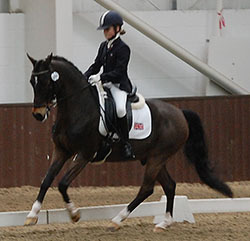 The other British riders scoring over 68% in this key selection test were: Erin Williams & Dynasty (DRP, Deinhard B x Arts-Dancer-Boy) and Bethany Horobin & Gigolo (DRP, Going East x Nordcap). The next day, all competitors were back in the ring doing the Pony Individual Test. Again, Semmieke & Deinhard B won but Jelle & Den Ostriks Dailan were moved down to fourth place by Phoebe & SL Lucci, who finished 2nd (and were the winners for two of the 3 judges!) and by Erin & Dynasty, who finished 3rd. Phoebe and Erin both scored over 72% in this difficult test as did Maisie & Rembrandt, who finished a very close 5th (a mere 2 marks behind Erin & Dynasty). Bethany & Gigolo scored over 70% for 8th place and Aimee Witkin and Ferrari (DSP, Malibu II x unknown) improved on their team test score to get over 68% in this class. Full results here. By the third and final day, some of the ponies were feeling tired, especially SL Lucci and the different combinations came to the fore inthe Pony Freestyle class. Winners this time were the last combination to go, Jelle & Den Ostriks Dailan, who overtook the long time leaders, Febe van Zwambagt (NED) & FS Dr Watson (DRP, FS Don’t Worry x Barkway Aramis). Semmieke chose to rest her two-times winner, Deinhard B, and rode her other pony, Der Feine Lord (DRP, Dressman 1 x Folklore) into 3rd place instead. Although there were no British riders in the top 3, they did fill the next 5 places. Erin & Dynsaty were 4th, followed by Phoebe and SL Lucci, Bethany & Gigiolo then Jade Ritchie & Principal (DRP, Principal Boy x Black Boy) and Aimee Witkin & Ferrari (DSP, Malibu II x unknown). Full results for the Freestyle are available here and the Consolation Test ones here. Bandalera (GBR, Ski Dancer x Corston Comet) & Madeleine Taylor. Placed 8th as Individuals in 2011. 2nd at Lincoln. Castleview Rakish Milly (IRL, Rakish Paddy x unknown) & Annie Keir. 1st at Aldon. 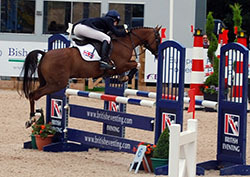 Team Silver and Individual Bronze in 2011 ridden by Jodie O'Keeffe (IRL). Cregaan Scenic (IRL, breeding not known) & Janou Bleekman. Members of 2011 Bronze medal Team, placed 13th individually. 2nd at Aldon. Cregaan Sceinc also won Team Silver in 2009 with Katie Bleekman. Koora III (breeding not known) & Harry Harding, 1st at Oasby and 10th at Aldon. The Sky Master (IRL, breeding not known) & Francesca Sargent. 2nd at Oasby and 12th at Aldon. Three Wells Breeze (IRL, breeding not known) & Charlotte Bacon. 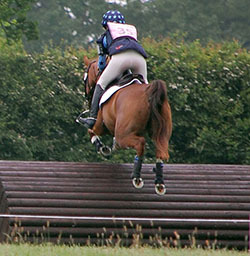 4th at Oasby & 8th at Aldon. 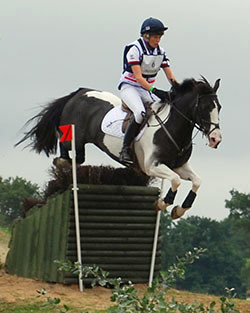 Three Wells Breeze (ridden by Sam Ecroyd) won Individual Silver & Team Bronze in 2011. Noble Springbok (IRL/ISH, Kiltealy Spring x unknown) & Grace Walker. Team Gold & Individual Silver in 2010 & Team Bronze in 2011. 28th at Lincoln after a good dressage, clear SJ and a slow clear XC. 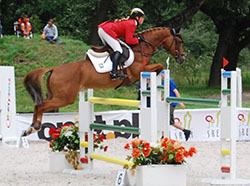 Noble Springbok has an impressive Pony Euros record, also achieving individual Bronze (2005), Silver (2006) and Gold (2007) medals and 3 team medals with previous riders Laura Collett (2005) and Libby Soley (2006 & 2007). Done and Dusted VI (IRL, Dusty Boy x unknown) & Francesca Fitzherbert. 34 at Oasby & 10th at Lincoln. Done and Dusted VI won Team Gold in 2010 and Team Bronze in 2011 with Sophie Beatty. The next Team Trial is at Weston Park (14-15 April). Dynasty (GRP; Deinhard B x Arts-Dancer-Boy) & Erin Williams (2010 & 2011 Team member with Danny Boy B). Scored 71.28% at Myerscough (2nd) and 75.064% at Keysoe (1st). SL Lucci (DEN SC; Lucas x Bazar) & Phoebe Peters. Scored 67.39% at Myerscough (3rd) and 75.064% at Keysoe (2nd). SL Lucci was on the 2011 Danish Bronze medal winning team. Gigolo (DRP; Going East x Nordcap) & Bethany Rose Horobin. Did not compete at Myerscough and scored 72.885% at Keysoe (3rd). 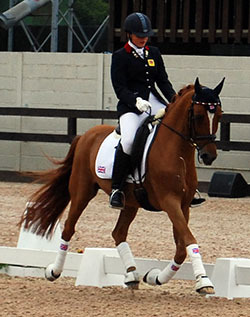 Team reserves in 2011 and Gigolo was on the 2009 & 2010 British teams with Claire Gallimore. Siepke's Celtic (NIPo, Bjirmen's Wytse x Oakley (C) Bubbling On (BRP)) & Robyn Smith. Scored 66.62% at Myerscough (5th) and 70.769% at Keysoe (5th). Dublin (Dutch Sports Pony; De Vito II x Evenaar) & Alex Hellings. Scored 63.38% at Myerscough (15th) and 68.654% at Keysoe (6th). Madams Miss Maria (NWPCS NWR; Woldhoeve's Silco x Wester Aikema's Norbert) & Harriette Williams. Scored 66.11% at Myerscough (8th) and 68.141% at Keysoe (7th). Invited ponies will be expected to compete at both Withington Manor and Brand Hall in order to be considered for the European Championships. Brand Hall will be the 2012 Final Trial. The British Dressage Pony Squad will be chosen by selectors, Jenny Ward, Sarah Pidgley and John Robinson and announced soon after the 17th June. A key part of the selection process is the performance of ponies in the FEI Team Test, where they are expected to be achieving consistent results at 68% or above. In particular, the selectors expect the ponies to compete at at least two of the following nominated competitions: Mysercough Premier League, Keysoe U21 Premier League, Addington CDIP and Somerford Park Premier League. They must also compete at the compulsory final trial at Wellington Premier League (10 June). 26-27 May - Somerford Park Premier League.